Absolutely! SillShield.com is protected by a high grade SSL certificate to keep your personal information, including billing, safe. Also, our shopping cart is fully PCI compliant, meeting the strictest standards in online security. What size Sill Shield should I select? 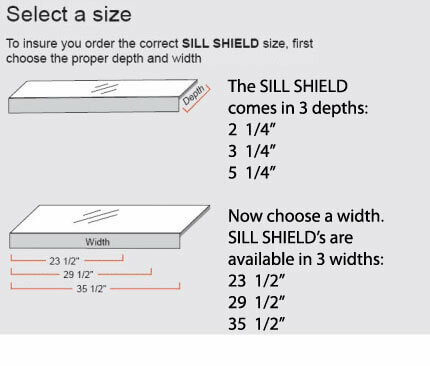 We offer Standard Size Sill Shields that fit most common windowsills (see the Sizing Chart below). If your windowsill does not fit a Standard Size, we also offer Custom Sized Sill Shields. We accept Visa, MasterCard, Discover, and American Express for credit card payments. You may also pre-pay by check or money order by mailing your payment to: Magnum Plastics Inc, 13 Erica Lane, Greenwood Lake, NY 10925. Please make your check out to: MAGNUM PLASTICS INC.
What shipping methods do you use? Can I get rush shipping? We use UPS Ground or USPS Priority Mail, whichever is faster to your location. All orders ship out within 48 hours, and most arrive in 3-5 business days. If you require expedited shipping, please let us know and we can send your order by UPS 3rd Day, UPS 2nd Day, or UPS Next Day Air for an additional charge. Rush shipping charges are not refundable. Do you ship to P.O. Boxes, or to APO/FPO? We are able to have your order sent to all of those types of addresses at no additional charge by using the United States Postal Service (USPS). Rush shipments that use UPS cannot be sent to P.O. Boxes, APO, or FPO. A physical street address is required for all UPS shipments. Our shopping cart only allows U.S. and Canadian addresses to be entered for shipment, but international customers may call us for a freight quote and we can arrange for international shipments upon request. All of our products come with an unconditional 60 Day Money Back Guarantee! If there is any reason that you are not 100% happy with your purchase, send it back for a full refund. If it ever wears out, I'll just send you another. Please note, however, that custom products, including custom lengths, are not refundable under any circumstance.